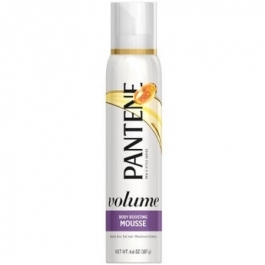 Pantene Fine Hair Solutions Triple Action Volume Mousse supports the structure of fine hair to boost style. The triple-action technology lifts hair at the roots while defending fine strands against humidity. The result is all-over volume that lasts all day. Flammable. Avoid fire, flame or smoking during application. Use only as directed, contents under pressure. Do not crush, puncture or incinerate. Do not store at temperatures above 120° F. Keep out of reach of children. Shake can and dispense into palm. Spread evenly on damp hair. To be style savvy: Flip hair upside down as you begin to blow dry. When hair is slightly damp, dry using a round brush for volume. For a natural look, scrunch mousse into hair and air-dry.